Adam Weinert, CC Chang in ECLIPSE. In the most breathtaking passage of ECLIPSE, choreographer Jonah Bokaer’s new collaboration with visual artist Anthony McCall, four dancers resemble celestial bodies in motion. 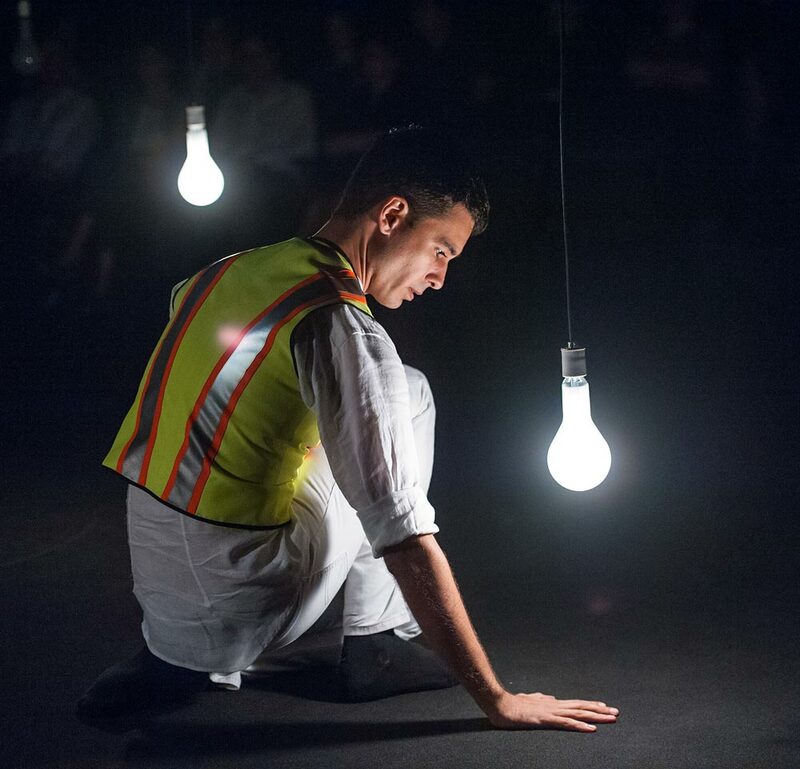 At center stage, Adam Weinert and Tal Adler-Arieli move through a series of balances, gently grasping each other’s ankles, necks and shoulders. Sara Procopio stands a few feet away, a moon spinning in place before gravity pulls her toward the two men. 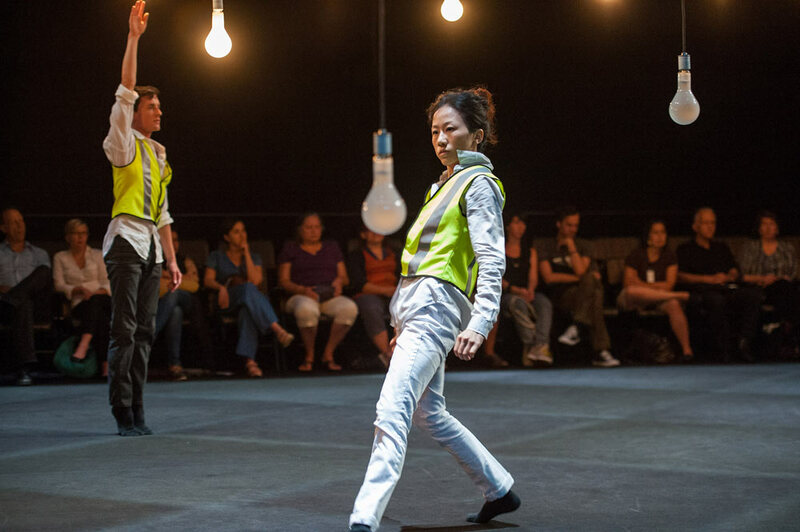 Meanwhile, CC Chang traces the edges of the stage as though in orbit, her body blocking the audience’s view of the other dancers. The piece’s title suddenly becomes literal. It’s one of many moments that demonstrate Bokaer’s ability to take ownership of a space, a fitting quality for the work that opened BAM’s Fishman Space, a handsome black box theater with high ceilings and two levels of comfortable seating. (On Saturday, the theater’s fourth day in operation, it still smelled like a new car.) For performances of ECLIPSE, audience members were seated on all four sides of the stage, recalling some of the site-specific works of Merce Cunningham, whose company Bokaer danced with for seven years. The mood of the hour-long piece hangs heavily on McCall’s installation – a sloped diamond of suspended light bulbs – and David Grubbs’ sound design, which includes recordings of a sputtering 16-milimeter projector, trains, and an airplane. 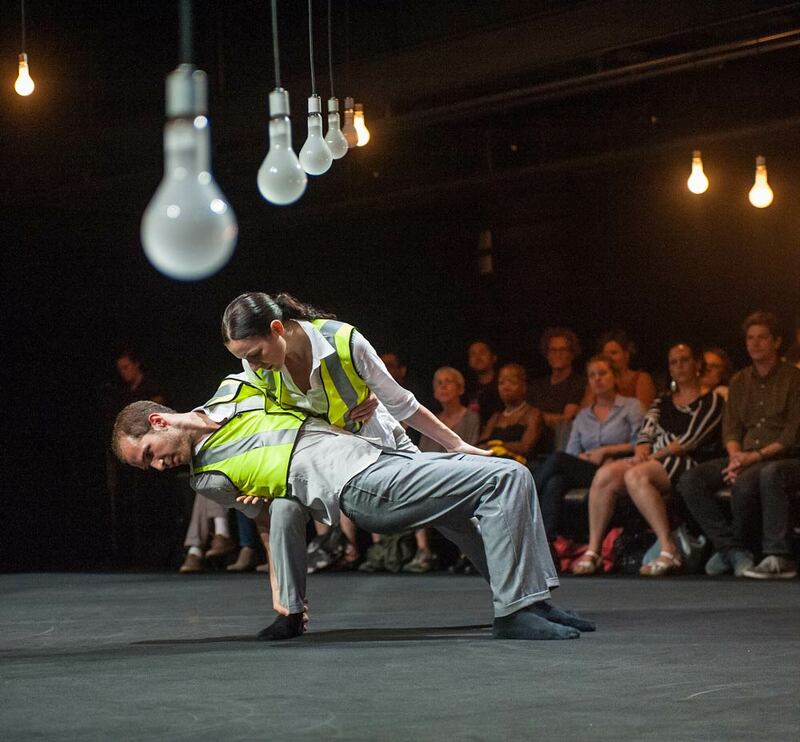 The light of the bulbs shifts from warm to cool, and the environment they form isn’t an incidental one: the dancers gaze at them, wrap their arms around the cords they hang from, and even beckon to them but never touch them. Two solos by Bokaer bookend the piece and establish its soft, serene style. He starts at one corner of McCall’s installation then weaves his way through the installation, turning in place, sliding on the floor and swatting the air with a fist as the bulbs brighten two by two in a symmetrical pattern. The four other dancers, dressed similarly in white shirts and pants and bright-yellow crossing guard vests, enter from opposite corners, form a square and face each other while Bokaer stands behind as if presiding over a ritual. He then leaves them. The four move through a number of sections, punctuated by darkness, which are either cosmic or geometric in form. Collisions between dancers are often unexpected and grippingly tender. They trace orbits of different radii, form squares and lines, and break apart in the four corners of the square space. Although the sound of the projector is monotonous, Bokaer’s choreography occasionally appears to be musical, as when three dancers in unison move in rhythmic counterpoint to a soloist, or later, when all four rumble, throw their fists and kick in canon. Tal Adler-Arieli, Sara Procopio in ECLIPSE. It’s easy to admire ECLIPSE for its moments of understated beauty, its modesty, its craft, and the quality of the dancing. Why, then, does it ultimately feel so cold and empty? It’s too long, for starters, exhausting its dance vocabulary quickly. Of the dancers, Bokaer fares the best, in large part because he seldom appears. The others, tasked with repeating the same steps and balances, too often seem cold, remote, and inhuman – much like the faraway planets they bring to mind. Thanks for this well written review. The piece sounds intriguing, despite your concern about its coldness. It’s curious whether or not the choreographer intended for it to feel that way, or is it evident of something lacking? Is there a feeling of cold loneliness when we think of an eclipse? I love the idea of the four walls of an audience, it would be nice to experience this more often in dance. What we see from various sides is so subjective, perhaps much like how we feel when catching an eclipse.